You just found a fantastic work from home job. Great pay and hours — just what you’ve been looking for. But before you give out your personal details, make sure you don’t see any of these red flags. Scammers often use the same basic moves, and we see most of these telltale signs again and again! 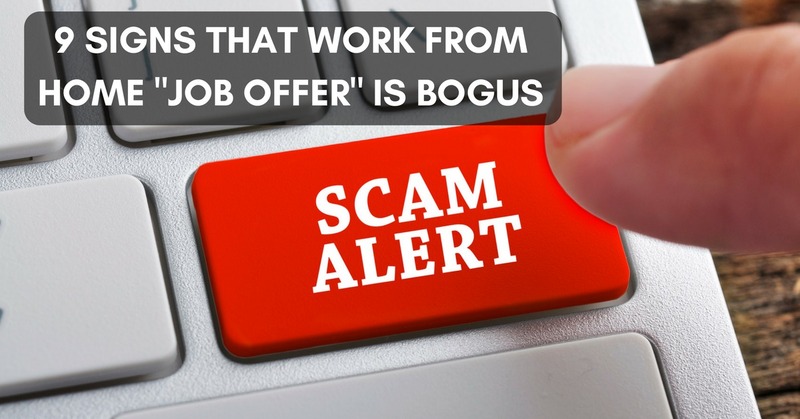 Millions of trusting job seekers fall prey to scams each year. But with caution and information, you won’t be one of them! — You’re contacted by an “employer” you didn’t apply to. We often hear from people who’ve gotten job offers out of the blue, asking if the offer is real. An “interviewer” will have your resume, but you never applied to the company for a job. A big red flag! Scammers harvest resumes from CareerBuilder, Indeed and similar job sites and use them to find victims. They’ve also infiltrated LinkedIn and other networking sites. If you get an email or phone call from an “employer” you haven’t contacted, don’t fall for the “offer” — it’s almost certainly a scam. — “Beaches, Benjamins and Bling.” Scammers know that many job seekers are desperate for work. So they decorate their come-ons with the trappings of wealth. If the ad features Bentleys, beachfront villas, and $100 bills fanned out across the page, watch out. — The job offer involves a “program,” a “system,” etc. A job is a job. The employer needs you for a specific role. There’s no “program” involved, no system, no kit, no membership fee. If someone offers you a program for working from home, it’s not a job. It’s a program. — Your contact is using a Gmail or other non-corporate email address. This is not an ironclad rule, since some newer companies and smaller players may occasionally use non-corporate email. But on the whole, legitimate employers have corporate email accounts. If your contact has a non-corporate email address, be more cautious than usual, as scammers frequently use non-corporate accounts. — High pay for entry level work. This often appears in data entry scams. If the “employer” is promising a high hourly rate for basic administrative work — especially when they emphasize “No Experience Necessary!” — you’re almost certainly in scamtown. Many people are looking for entry level work, so employers don’t need to offer high pay to get help. Steer clear! — The “job” involves wiring funds. This often shows up in mystery shopping scams, where victims are sent a cashier’s check. You’re told to deposit the check, and keep a generous fee — this is the worm on the nasty hook — plus money for the shopping you’ll do. Then wire the rest to your friendly hirer. The scam may also involve an offer to pay for your home office equipment. But again, the check will be bogus, and any funds you wire will be lost. — The “employer” wants to interview you via text on Google Hangouts. Scammers always try to conceal their identity. Through text, they can create an illusion of legitimacy and urgency that would be hard — or impossible — for them to do with video. So they stick to text, and if you ask, they’ll refuse to move to video. Time for you to move, too — away from their offer! — Typos and bad grammar in the offer. A legitimate employer will prepare an ad or offer that typically has few if any errors. But English is often not the scammer’s native language, or he/she is simply recycling an old (crude) scam text. — Your intuition is sounding alarm bells. If you’re looking at a job offer and feeling uncomfortable about it, go with your “gut”! We’ve all seen the posts at some point online, “Something seemed fishy about the whole thing, but I needed the money and went ahead with it anyway…” If it seems “fishy,” bail! For legitimate work from home jobs and side gigs, check our Newest Jobs & Gigs page. Good luck in your work from home plans, and safe searching! This entry was posted in Job Search Information, Scams, Work at Home Jobs. Bookmark the permalink. ← 140+ Work from Home Jobs With Cigna – Great Benefits!